When hitting REPLY to a thread’s first post, it goes at the end of the replies with no indication that it’s replying to the original comment, or replying to the last reply in the list. And sometimes that context changes how that reply is interpreted (especially after additional replies are subsequently added). Whoever maintains the underlying discussion-management framework ought to consider how that ambiguity might be eliminated the next time they discuss potential features and enhancements. did you hit the blue reply button or the reply to button in the message box? The blue button is a general reply to the thread so it owls give no indication. The thread had two comments – the initial question and one response. I confirmed the response, and started by hitting reply on that response… but then realized my reply was really to the initial comment. So I cancelled, then hit reply to the first comment, and entered it. And my response had no indication which it was a reply to. So I tried the process on a couple of different threads and noticed the same general behavior. Not exactly a rigorous experimentation process, admittedly. So my inferences could be off. A lot of sites purchase a product written and supported commercially for managing their user comments section. Others have tried to save money and retain control by using their own home-grown (and also self-maintained) code. Do either of those models apply to GoHub’s forums? I think it doesnt show who your replying to when you reply to the LAST post. 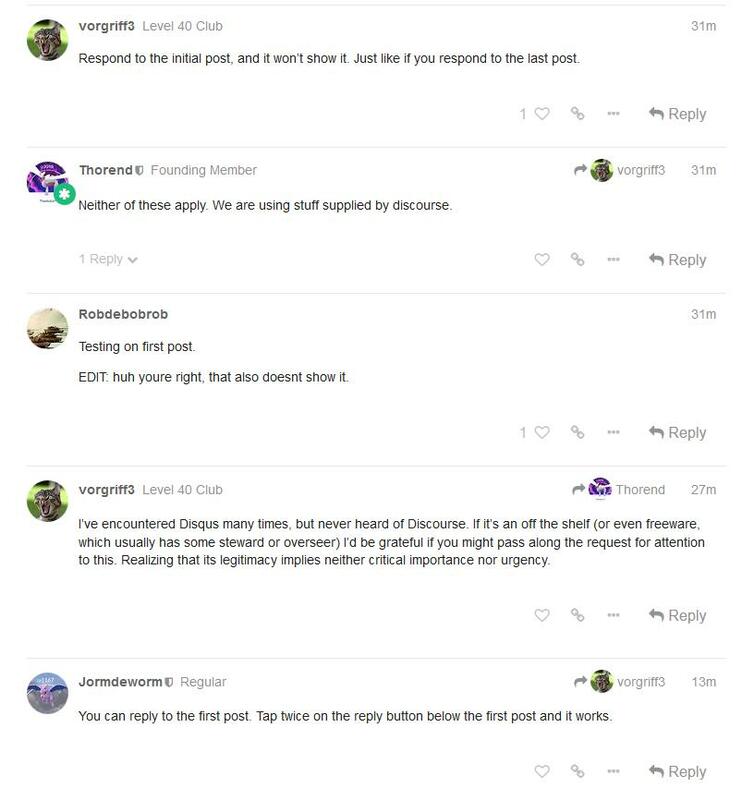 EDIT: I replied to Vorgriff3’s post right above mine to test this, and it doesnt show it. EDIT: Replying to Thorends post 2 posts above mine DOES show it replies to him. So i think the error is there somewhere. Respond to the initial post, and it won’t show it. Just like if you respond to the last post. Neither of these apply. We are using stuff supplied by discourse. EDIT: huh youre right, that also doesnt show it. 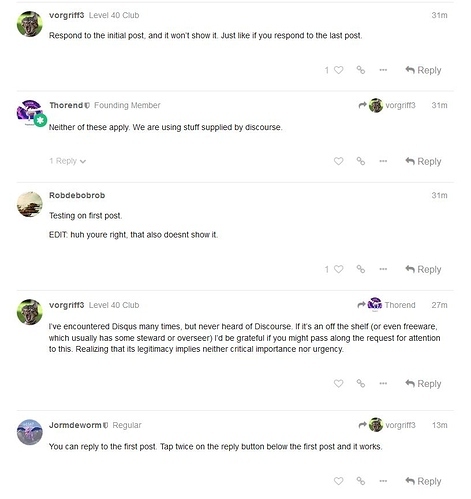 I’ve encountered Disqus many times, but never heard of Discourse. If it’s an off the shelf (or even freeware, which usually has some steward or overseer) I’d be grateful if you might pass along the request for attention to this. Realizing that its legitimacy implies neither critical importance nor urgency. You can reply to the first post. Tap twice on the reply button below the first post and it works. I allways have the sensation that I don’t see to whom I answer, but in posts of others I see it. And I was thinking it was my imagination… So same here. Hmm, when I hit reply below the first post it brings up the box for entering reply text. It didn’t occur to me to hit reply a second time, since it already seemed to do its job. Astute observation of an interesting functionality. Thanks, @bagguille. If I’m replying to post directly above, I’ll throw up the 3 ^^^ and then put the @Cup out there, so they know I’m talking to them. ^^^ @Cup works for me. You can tell I’m talking to you, right?